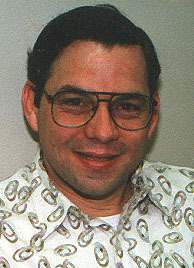 Photo of Rob Vanya taken in spring of 1998. Click on the Scrapbook link at the bottom of the page to see photos of family and friends. The first link below connects to a short, easy-to-understand book with instructions on how to have your prayers answered. The second link connects to a study containing the most important teachings of the Bible in condensed form. The fifth link, called Discovery, connects to a book written by Rob Vanya that was published by an international publishing company in 1992.